The Federal Motor Carrier Safety Administration (FMCSA) Eastern Service Center and Midwestern Service Center declared a Regional Emergency in anticipation of severe winter weather events expected to directly affect multiple states, including Ohio. The emergency declaration waives hours-of-service requirements for those providing assistance to the affected states, including the delivery of propane, natural gas, fuel oil, and gasoline. The states included in the FMCSA Regional Declaration are: Connecticut, Illinois, Indiana, Maine, Massachusetts, New Hampshire, New Jersey, New York, Ohio Pennsylvania, Rhode Island, and Vermont. The emergency declaration is linked here for your reference (PDF). The waiver is effective immediately and until 11:59 pm Saturday, February 2, 2019. The OPGA encourages all drivers operating under the terms of the FMCSA Regional Declaration to keep a copy of the declaration in their vehicle. The latest guidance on emergency declarations and waivers by the National Association of State Energy Officials is available here (PDF). The OPGA reminds all members that an hours of service relief does not change safety practices. ALL drivers should continue to follow and operate in the safest manner possible. The OPGA remains firmly committed to keeping the Ohio propane industry safe. Due to logistical concerns and the colder than normal temperatures, both the State of Ohio and the federal government have granted temporary hours of service waivers to propane transporters in the state of Ohio. The OPGA reminds all members that an hours of service relief does not change safety practices. ALL drivers should continue to follow and operate in the safest manner possible. The OPGA remains firmly committed to keeping the Ohio propane industry safe. The OPGA hopes that this temporary waiver will allow all members time to catch up and meet the increased demand. The OPGA hopes that this temporary waiver will help avoid any further concerns for an emergency within the Ohio propane industry. Among the many highlights of the 2017 Annual OPGA Summer Convention was the presentation of the first OPGA Legislators of the Year Awards. 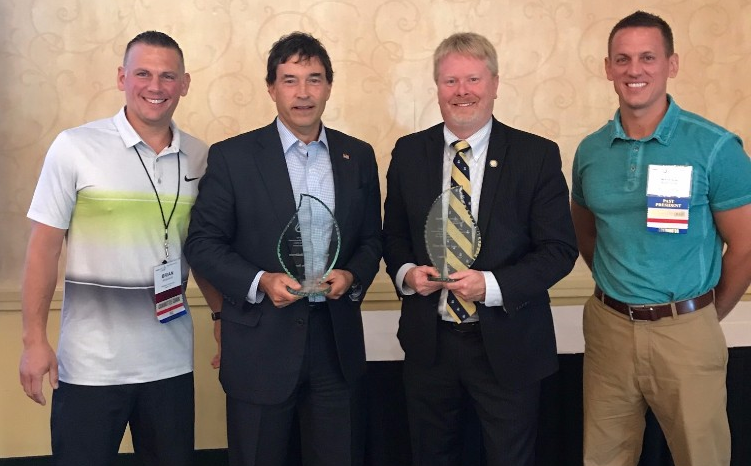 The awards were presented to State Senator Troy Balderson (R-Zanesville) and State Senator Sean O'Brien (D-Youngstown) for their leadership and assistance to the Ohio propane industry. The awards were presented by OPGA Government Affairs Committee Chairman Chris Buschur and Immediate Past President Brian Buschur. "I am truly honored and humbled to receive this distinction," said Senator Balderson. "It is critical that we continue to make wise investments and work to protect our state's natural resources." Senator O'Brien agreed and added, "It has been an honor to have led the fight to expand alternative fuel use - like propane autogas - here in Ohio." The event will include interactive round-table discussions facilitated by managers of The 100 Best Fleets in Michigan and Ohio. Rochester Hills has been nationally recognized for their shared services with 21 other agencies to identify cost savings while maintaining the same levels of service to include purchasing of equipment at significant discounts with no RFPs required. In-sourcing is one of the biggest trends in the country and provides job security. Allan Schneck, Public Services Director will also discuss "outsourcing;" when does it make economic sense? George Survant is considered one of the best informed fleet minds in America. He was the Fleet Manager for Florida Power and Light when they were in the top 100 Fleets. He successfully supervised 20,483 vehicles at Time Warner Cable, was named AF Fleet Manager of the Year in 2016 along with receiving 5 other major national awards for excellence in fleet management during his 40 year career. George is now the Senior Director of Fleet Relations for NTEA, the Association for the work truck industry representing 1900 companies. This is a rare opportunity to hear from one of the thought leaders in the industry including many strategies and insights you can implement the next day. He has keynoted many national fleet conferences and is considered one of the best presenters in the industry. Hayes Smith, CST Fleet Services, Winston-Salem, NC was responsible for the fleet turnaround in Detroit after the biggest financial bankruptcy in history. Detroit Fleet is now even "in-sourcing" work. Learn from the practices implemented immediately for this only-in-America success story. Hayes also worked with Dallas Fleet who they consider, their best run fleet in 40 years making The 100 Best Fleets for the first time ever. Clean Cities will present an update on the $4.7 billion dollar Volkswagen payout to public fleets virtually giving you FREE vehicles. For those needing overnight accommodations, there is a group rate discount available for this event under G-ICOM. Individual attendees can make reservations for the event directly with the Hyatt Place at the Suburban Collection Showplace reservations at 1-800-233-1234. Click here to make overnight reservations online. Use the Group Code: G-ICOM to receive your discounted group rate of $129.00. Once the arrival and departure date have been entered, click on special rates and then enter the Group Code in the Group Code Box (make sure to include the G when entering the code). 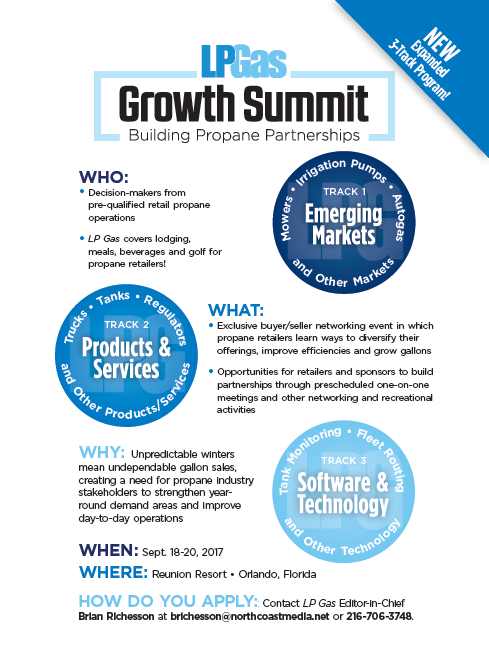 LPGas Magazine would like to extend a special invitation to you for its annual LP Gas Growth Summit. The Summit is scheduled for Sept. 18-20 at Reunion Resort in Orlando, Florida. Click here for the agenda. This is an exclusive buyer/seller networking event where propane marketer members are able to meet one-on-one with top propane vendor partners and learn new ways to grow gallons and improve operational efficiencies. You should also know that LP Gas Magazine covers all expenses at the event, including lodging, meals, beverages and golf. All you have to do is get to Orlando, Florida! If you are interested, LPGas Magazine asks that complete the short online application at the link below. They will follow up with you afterward with more information. To hear what past retailer attendees have said about the event, click here to see a video. Click here to Ask Congress to Exempt the Propane Industry from OSHA's Crane Rule. A rule from the Occupational Safety and Health Administration would require the operators of cranes for propane tank deliveries to undergo a third-party certification every five years. This onerous rule has been delayed repeatedly since 2010; however, we want a permanent exemption. Together, we can gather a bipartisan coalition of U.S. House Members to send a letter to OSHA urging for a complete exemption. This request will take less than two minutes to complete. The deadline for Members of Congress to sign on to the letter to OSHA is Friday, August 18. The summer is going by like lightning, and everyone at CareWorksComp hopse you are able to enjoy great family time and maybe a summer adventure or two...it's not over yet! As we approach the fall and the fourth quarter of the year, it is time to begin planning for a successful and profitable 2018. August 15, 2017- yesterday marked the due date for the policy year 2016 payroll true-up report! This report must be on file with BWC by that date, or your participation in discount and rating programs may be in jeopardy. Click here for more details. August 30, 2017- due date for the DFSP action plan (DFSP-5) for a 7/1 program start date. Please note this is for advanced level only. September 30, 2017- "snapshot date" that BWC uses to capture costs in claims for the 2018 experience calculation. Future Dating of BWC Premium Payments: As of June 30, BWC began allowing for future dating of premium payments, available through their website, www.bwc.ohio.gov. You can now schedule future payments to avoid missed or late payments and for true-up reconciliation. If you would like to schedule multiple installment payments, you can do so through the "Accounts Receivable" screen by choosing different dates for each one. All payments must be ACH. 2018 Group Programs: Group Rating renewals have been sent out to our current clients, and Group Rating and Group Retro invitations are being sent now through the end of summer. Businesses may have eligibility for multiple programs, or dual eligibility, in which case they have or will receive both a Group Rating invitation and a Group Retro invitation. We are eager to discuss what looks best financially, and in form and function. Here's to another tremendous year of administrating successful workers' comp savings programs for our clients! New Payroll Reporting Caps: For the 2017 policy year (7/1/17-6/30/18), BWC has updated the payroll reporting caps for corporate officers. The minimum reportable wage per person/per week is $451, and $1353 is the maximum. Note: Officers are considered active if they are engaged in any work on behalf of the corporation. Employers listed below who choose elective coverage (because they are not required to carry workers' compensation insurance). Non-officer board members are not subject to the officer minimum/maximum rules. Incident checklist: Click here for the updated Incident Reporting Checklist that our safety department, RiskControl360°, created for our clients. You probably (hopefully) already have something similar in place but please look this over in case there areas you didn't think about. It also ties in when to contact your MCO, and when to contact us, your TPA, as this is always a bit of a gray area. Following are updates on three grant opportunities for projects to replace or reduce pollution from diesel vehicles. Information on all three programs is posted on the Ohio EPA Office of Environmental Education website - look for the grey tabs in the middle of the page. DRAFT application guidelines and forms are now posted on the AFV program webpage for review. Ohio EPA considered seven comments received from Interested Parties in June, and has tried to clarify how applicants can demonstrate that proposed vehicle conversions are compliant with US EPA requirements. Please send questions about these draft documents to derg@epa.ohio.gov. Ohio EPA is now preparing to file the rules, and hopes to issue a Request for Grant Proposals late this fall, once the rules are approved and in effect. A number of projects that received grants in December, 2016, are on hold awaiting Buy America waivers required from the Federal Highway Administration. FHWA has provided no explanation or indication of whether the delay is temporary or permanent. Ohio EPA and ODOT will not issue another DERG Request for Proposals without assurance from FHWA that the federal funds that support the program will be forthcoming. There has been some slippage in the schedule for this program as the Trustee continues to negotiate with the court and parties to the settlement. The Trust Effective Date is now expected sometime in August or September, to start the process for states to become certified as beneficiaries. Ohio EPA is drafting a mitigation plan that we expect to circulate for formal public comment sometime this fall. During early stakeholder outreach in late 2016, the most requested uses for the VW funds in Ohio were school bus replacements, transit bus replacements, and electric vehicle charging stations. Ohio EPA is drafting a plan that includes all ten allowable uses of the funds. We expect to release the first Request for Grant Proposals sometime during the first half of 2018. More information on all these programs will be posted to the Website and shared with interested parties as it becomes available. Most - if not all - of us probably have a life insurance policy. We can use these great financial planning tools to protect our family assets, our business assets, for coverage on key employees, for business transition (buy-sell) protection, etc. Making sure your beneficiary designations are clear, accurate and up to date is essential. Is your life insurance beneficiary designation up-to-date and accurate? If not, your policy's proceeds could be subject to unnecessary taxation or, worse yet, end up somewhere you don't expect. Rarely do beneficiary problems begin when the life insurance policy is issued. Instead, they arise as we change. Birth, divorce, graduation, and even tax law changes can alter the practical effect of your policy's beneficiary designation. A quick review will help make sure it correctly reflects your true intentions and does not expose you or your beneficiaries to unnecessary taxation. Your financial protection should be a primary concern to you and your financial planner or insurance agent. Contact your financial planner or insurance agent today to review your beneficiary designations and all your current financial needs. Fleets use the Alternative Fuels Data Center Station Locator to find vehicle refueling stations every day. Now is a great time for you to take a moment and review your information on the locator. Maintaining an accurate listing that displays your hours of operation and address ensures fleet customers can find you easily. To get your station listed, marketers can simply complete and submit the online form . You will be contacted to verify the information by the AFDC team. Once your listing is live online, you should promote it to area fleets. Every year, you will be contacted to confirm you information is still up-to-date. If you are already listed on the locator and have not been contacted by the AFDC team in the past year, you should verify that your listing is still up to date. If it is not, you should click on the "Report a change" link on your station listing. Open to the public(fleet customers). Staffed duringregular business hours - no calling ahead required. Offer a dedicatedfuel dispenser for vehicles. It's important that marketers understand the differences between primary and secondary stations, and list your stations correctly on the locator. OPERC reminds all Ohio propane marketers that rebates remain available for autogas and duty to warn safety programs. Under the Autogas Rebate Program, rebates are available to propane customers who reside in Ohio for eligible purchases on a new propane vehicle. Any new OEM vehicle or lawn mower system that is approved by the U.S. Environmental Protection Agency and is registered and operated in the state of Ohio is eligible for a $1,000 incentive payment. Click here for more information. Or you can visit the new OPGA Autogas website. The Duty to Warn Program is designed to reimburse a propane dealer for some expenses associated with mailing duty to warn information to their customers. Marketers that choose to participate will purchase the Duty to Warn materials they need, have them shipped to their plants, and submit a receipt or proof of purchase to the OPGA. OPGA staff will then reimburse up to $500 to the marketer. Click here for more information. To answer requests made by the industry, members of the PERC Safety and Training Working Group worked diligently to produce six new consumer safety videos. Topics include how to read a tank gauge, transporting small cylinders, propane system inspections, and what to do if you suspect a gas leak. You can share these videos with customers. You can add your own customized company message. And you can add them to your website. Need help? Call the PERC help desk at 202-452-8975. As all of us in Ohio know, Ohio is all too familiar with beating Michigan, and the Ohio Propane Gas Association can claim one more Buckeye victory. As you may recall, OPGA Executive Director Derek Dalling donated all four of his prized tickets to the University of Michigan-Ohio State University football game to the Michigan Propane PAC and the Ohio Propane PAC as a fundraising challenge for the two states. Both states had fun with the donation, and both state propane PACs benefited. The two tickets donated to the Michigan Propane PAC raised $355, and the winner was none other than OHIO Past President Bob Herron of The Energy Cooperative. Not so coincidentally, Bob also won the two tickets donated to the Ohio Propane PAC with a winning bid of $360. As part of the challenge, Derek also plans to reward Bob with Ohio State t-shirts for the Ohio Propane Gas Association beating the Michigan Propane Gas Association.